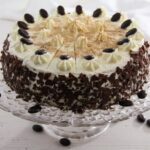 An amazingly moist, grown-up cake with lots of whiskey, cappuccino and coffee and filled with a luscious cream cheese and whipped cream filling. I do like making elaborate, festive cakes, you will find quite a few of them on the blog, cakes or tortes like this Dobos Torte – Hungarian Cake with Chocolate Buttercream and Caramel or this fresh and Amazing Lemon or Lime Buttermilk Torte, they are really two of my favorite cakes. But I have never made such a cake as today’s whiskey cake with cream cheese before. 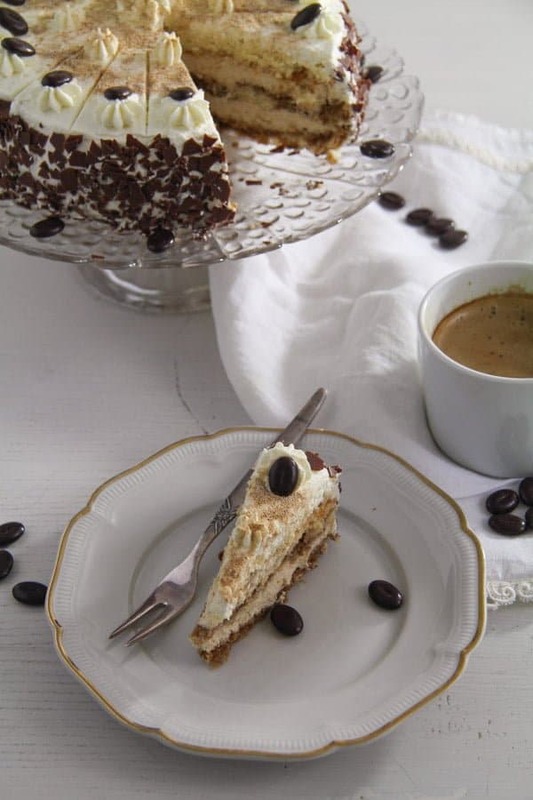 A really grown-up cake with quite a bit of whiskey in it, with cappuccino and coffee, so moist and soaking with the good stuff, so different in taste from your normal cake, really something special. I have made this a couple of weeks ago for my brother-in-law’s birthday and we all loved it. The only drawback was that I had to bake an extra cake for the kids, which involved a bit more work and time, but that was not that bad in the end anyway, the so-called children cake was delicious as well. 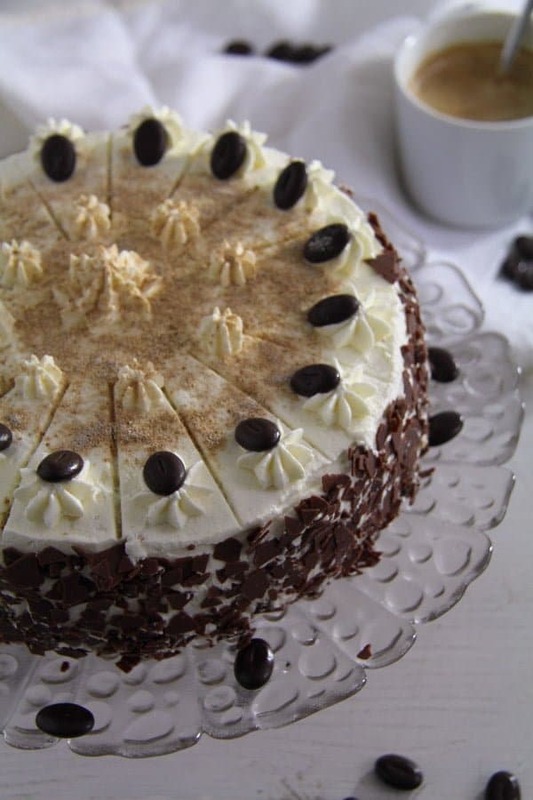 That was an Estonian cake called Kräsupea or Curly Top Cake, you can find the recipe here, if you are curious. 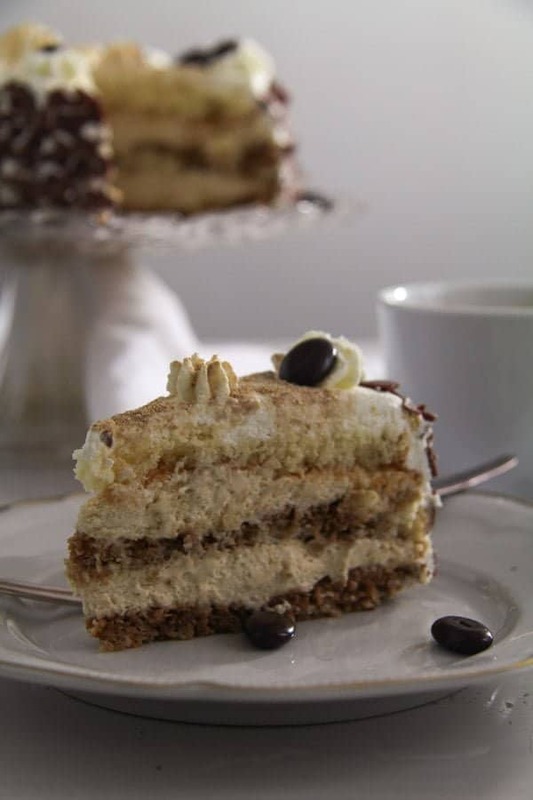 I actually meant to post another kind of coffee cake during this Romanian Christmas Food series, something that I have eaten in Romania from time to time. However, while searching for a recipe that was somewhat similar to what I had in mind, I stumbled upon a cake, which I knew I had to recreate. It was not exactly the kind of cake I wanted to post, but it looked and sounded so good, I knew I had to give it a try. I changed quite a few things on the way and we all liked it so much!! My husband ate 3 slices on the birthday afternoon and the remaining 3 slices in one go the next evening at 10 o’clock!!! Well, he loves coffee and whiskey, so this cake was really his thing. To make the cake base itself I used an old and trusted recipe, I must have baked this at least 100 times during the past 10 years. It is easy to mix, it tastes great and it always turns out perfectly. as well, I think it should be available all over the world and if not, keep in mind that American baking powder is double-acting while the German Dr. Oetker is single-acting. The most important difference when working with these two types of baking powder is that single-acting baking powder will start the raising process as soon as the ingredients are mixed, so when using baking powder like Dr. Oetker you absolutely have to preheat the oven and have it hot when the batter is ready to go in the oven. If you let the batter stand and wait for the oven to get hot or place the batter into the cold oven, the cake will not rise. When using American kind of baking powder, which is double-acting most of the raising process takes place once heat is applied, so it is not so bad if you forget to preheat the oven and let the batter stand shortly before you bake it. I soaked the cake base with lots of whiskey coffee, which made the cake really moist, one of the moistest cakes I have ever made. We loved it like that, it was really wet and soft and so full of coffee and whiskey flavor. However, if you think you want to have a less moist cake base, you could start soaking the cake with only 2/3 of the liquid and add more to your liking. I used quite a lot of whiskey, at first I only took the quantity requested by the original recipe. However, I found that to be too little, the cake did not really taste of whiskey, so I added more. We loved the way the whiskey cake turned out, you could really taste the alcohol. But this is a matter of taste as well, use more or less according to your taste. I started with 3 tablespoons for the filling, but after adding the whipped cream to the filling, I found that the delicious whiskey flavor had quite disappeared, so I added 3 tablespoons whiskey more. , which we happened to have in the house and which is not as smoky as other whiskeys my husband enjoys. That was good for me, I am not an whiskey person and I especially don’t like the very smoky ones that my husband loves. But this one was perfect! is really easy once you get the hang of it. I tried to describe the process thoroughly in the recipe, however, if you need more information on working with gelatin have a look at the recipe for the No Bake Ricotta Sour Cream Cheesecake with Raspberries. Preheat the oven to 180 degrees Celsius/ 360 degrees Fahrenheit. Line the base of a 20 cm/ ca 8 inch springform with baking paper. Don't line or butter the sides of the form. Separate the eggs. Give the egg whites to a medium bowl, add the warm water and beat until stiff peaks start to form. Slowly and gradually start adding the sugar while beating all the time. Beat until the egg whites are stiff and glossy. 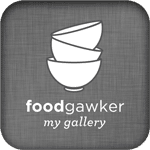 Ligthly beat the egg yolks in a small bowl with a fork. Give them to the egg whites and incorporate very carefully. In another bowl mix together the flour, cornstarch and baking powder. Sieve them over the egg mixture and incorporate carefully using a silicone spatula or a larger spoon. Pour the mixture into the prepared springform and bake for about 25-30 minutes or until golden. A tooth pick inserted in the middle of the cake should come out clean. If it is still wet, prolong the baking process for a few minutes and then check again. Remove the cake from the springform and let cool completely on a wire rack. Give the egg yolks, whiskey, sugar to a bowl and beat on bain-marie for about 10-13 minutes or until the mixture thickens slightly. You will have to stand by and whisk continuously. And make sure that the water doesn't start to boil at any time, if it does it will ruin your mixture. If the water starts to simmer, remove the double-broiler from the heat, continue whisking and only return the double broiler on the heat when the water has cooled down a bit, so it will not simmer anymore. When the mixture has thickened slightly, remove it from the heat and mix in the instant cappuccino powder. Leave to cool completely. When the egg mixture has reached room temperature, give the cream cheese to the mixture and incorporate, the mixture should be smooth. Place the gelatin sheets in a bowl and cover them with cold water. Let bloom according to the packet's instructions, 10 minutes in my case (I use Dr. Oetker gelatin sheets). See this post for more instructions on working with gelatin. When the gelatin has bloomed, place it in a saucepan (large enough to hold the entire egg-cream cheese mixture + the whipped cream at the end). Place the saucepan on the lowest heat possible and start dissolving it while stirring continuously with a spoon. This is a matter of seconds, do not let the gelatin overheat or start boiling, if it does you can throw it away, it will not be good anymore. Just stir for 10-15 seconds or until it becomes liquid without starting to simmer or anything. any risks of getting a clumpy filling. When all the cream cheese mixture is incorporated place the saucepan in the fridge and let the filling stand until it starts to thicken. It should only START to thicken and not become stiff already. In the meantime beat the heavy or whipping cream until soft peaks form. Check the cream cheese mixture after about 5 minutes or so and if it has started to thicken, carefully fold in the whipped cream. Taste the mixture and add more whiskey if you want a stronger whiskey taste. I did add about 3 tablespoons more. Boil the water in an electric kettle. Give the water to a small bowl and stir in the instant coffee, vanilla sugar and whiskey. Slice the cake into 3 slices. Cut one sheet of baking paper in two in the middle. Place the baking paper halves, slightly overlapping in the middle, on the cake platter. This will allow you to decorate the cake with whipped cream directly on the platter without making the platter dirty. When you are finished with decorating, carefully pull away the baking paper from underneath the cake. Place one slice of the cake on the serving platter. Soak it with about half the whiskey-coffee mixture. Use a bit less liquid for a less moist cake, it is a matter of taste, but we loved it really moist in this case. Give half of the cream cheese filling on top. 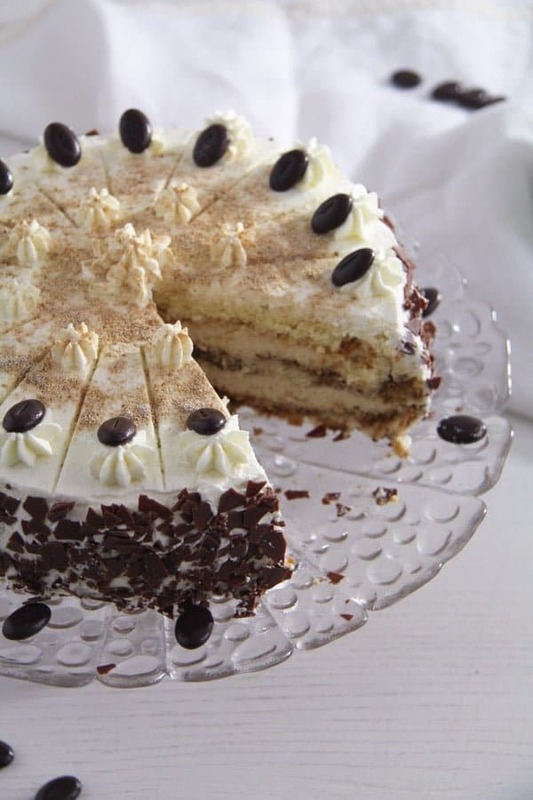 Place the second slice of cake on top and soak it with the whiskey-coffee mixture. Give the remaining filling on top and cover with the last cake slice. Place the cake in the fridge and let set for several hours, ideally overnight. To decorate the cake, beat the heavy or whipping cream with the vanilla sugar until stiff. Give 2-3 tablespoons of the whipped cream to a piping bag. Use the rest of the whipped cream to generously and smoothly cover the cake. Mark the cake slices on the top of the cake, 12 to 16 slices, depending on how large you want them. 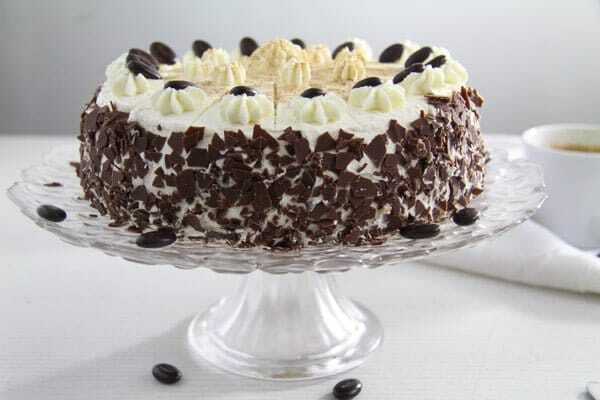 Pipe the remaining whipped cream on top of the cake and decorate with the chocolate coffee beans, if using them. 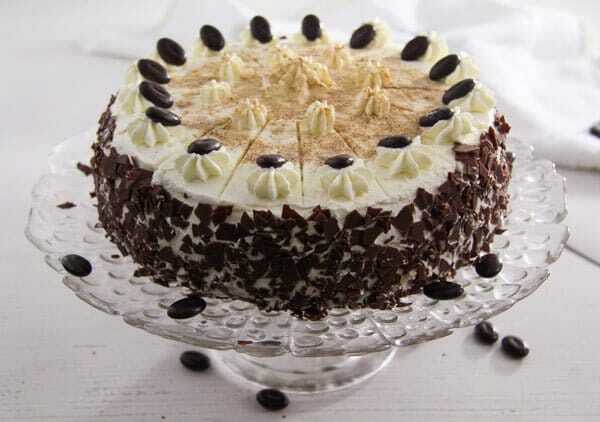 Sprinkle the top of the cake with some instant cappuccino powder and the sides of the cake with dark chocolate shavings. You have basically mixed all of my favourite things into a cake. Love this!! Looks amazing. I love boozy cakes, they have a stronger flavour and I do like that a lot. Fab cake.